More attention has been focused on the effort to defund Obamacare thanks to the now most vilified U.S. Senator of the year, Ted Cruz of Texas and the Senate vote today – Friday, 9/27/13 – is on whether to invoke “cloture” so that Harry Reid’s Senate Democrats can proceed to put back the funding that the House took out of the continuing resolution. 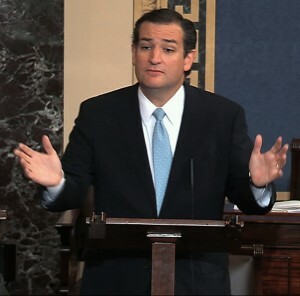 We think of it as the “Silence Ted Cruz” invoke cloture motion of Democrat Majority Leader, Senator Harry Reid. Conservatives are urged to telephone their own Senators, 202-224-3121 – to demand a NO vote on cloture and if possible call other Senators as well, go to the “Don’t Fund It” website. Conservative stalwarts like Mark Levin, are virtually unanimous in calling for a NO vote on cloture to support the effort of Senators Mike Lee, Ted Cruz, Jeff Sessions, Rand Paul, Marco Rubio and others. A total of 15 Republican Senators have announced they will keep their Party’s promise to stop Obamacare by voting AGAINST the cloture of Senator Harry Reid, which would then immediately lead to the majority vote to restore Obamacare funding. If every Republican votes NO on cloture then Senator Harry Reid will simply be unable to restore the funding for Obamacare removed by the GOP house.. At that point the Senate majority can either close the government down, or pass the spending bill already passed by the GOP controlled House. Some Republican Senators have already announced they will vote with Senator Harry Reid for cloture, despite their past calls for support for their election campaigns by conservatives, and their past pledges to oppose Obamacare. They do not explain, what will they do? They do not explain, if they aren’t willing to stand up to President Obama today in the Senate, how will their having a majority of Senators – if they can get that – grow them a backbone to stand up against the President in the future? Other Republican Senators are not yet announced. All of their phone numbers are available at the “Don’t Fund It” website – to thank those who are planning to stand with Cruz and vote NO on cloture, to ask the Republicans who are voting with Harry Reid to reverse course, and to ask the unannounced Senators to stand up to Harry Reid and Barrack Obama by voting NO on cloture to defend Obamacare. For an up to the minute report on how Senators stand on cloture – and their office phone numbers, go to “Don’t Fund It”. That’s the website that liberals of both political parties are screaming and whining about which now has 1.8 million Americans signed up. It is all a fundraising scheme, they bellow. This is echoed by some Republican leaders who are evidently, jealous at worst, or simply uncomprehending. If cloture is invoked the “continuing resolution” (or CR) to fund government will be passed by the Senate and sent back to the House with Obamacare funding restored. At that point conservatives are hoping their Congressmen will return the bill again, with Obamacare funding deleted, and government funding approved. Liberals are praying for a government shutdown, believing that they can rely on a segment of Republicans to join them in blaming conservatives for the President and Harry Reid’s enthusiasm for shutting down the government. A flood of phone calls to U.S. Senators demanding a NO vote on cloture is urgently needed. You can call the number 202-224-3121 or better yet call the office of your two Senators listed at the “Don’t Fund It” website, and then call other Senators too. This message is by Glenn Ryt of the Freedom Leadership Conference, and not necessarily the opinion or view of the conference or of those who attend or subscribe to the conference email newsletter, Freedom Digest. The next Freedom Leadership Conference is on Thursday, October 17 at the Fairfax Marriott at Fair Oaks, northern Virginia. Michael Thompson will speak at on a new tax proposal for Virginia. The Liberty Amendments proposal of Mark Levin is also to be featured. Read about this and more at the recent posting, Conservative Change Conference Set for October 17, 2013, HERE. The October conference will be sponsored by the Thomas Jefferson Institute for Public Policy (Michael Thompson, President). To register to attend the October 17 conference, which starts with a coffee and dessert “social” at 7 PM, go HERE. (advance registration is required for admission). 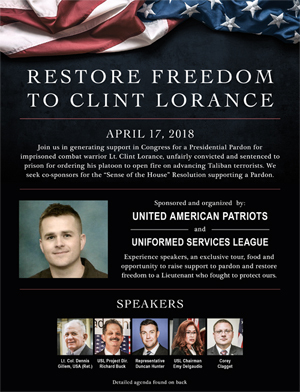 The Wednesday, November 17 Freedom Leadership Conference, to be sponsored by Uniformed Services League, is also at the Fairfax Marriott at Fair Oaks, and will feature keynote remarks saluting American veterans by U.S. Congressman Scott Perry (R-PA), plus a “part 2” of the Liberty Amendments. Each conference is sponsored by a different conservative organization, and begins with a coffee/tea/dessert social at 7 PM. This entry was posted in conservative news, Opinion. Bookmark the permalink.